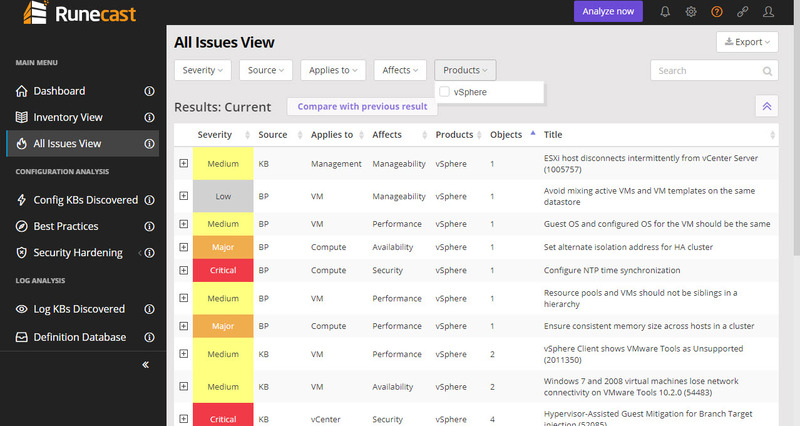 Runecast Analyzer is a suite for your VMware Infrastructure. 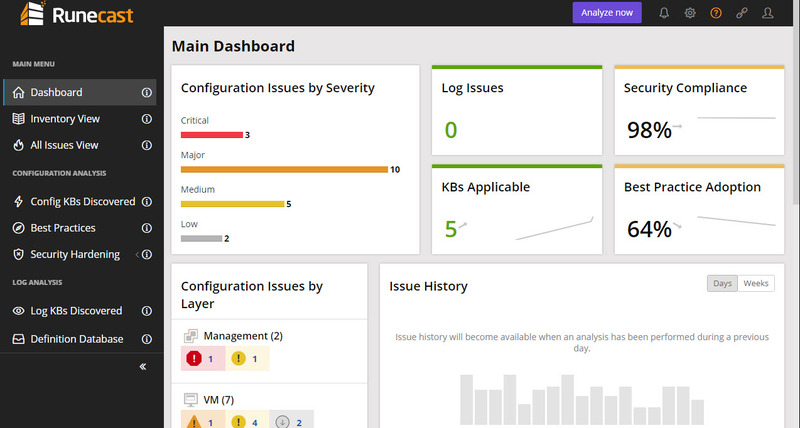 Runecast Analyzer comes with the Top 3 features which are VM Monitoring, Security Hardening and Log Analysis. So, you don’t have to depend on the other products for this feature. In this post we will have a look at VM Monitoring feature of Runecast Analyzer. VM monitoring is very crucial task for every IT Teams as Now days all the Production servers runs on the Virtual Machines. So, you must be very pro-active with monitoring so to avoid issues with the virtual machines. Runecast Analyzer is the solution which will do that thing for you. It pro-actively monitors all your vSphere Infra such as Virtual Machines, vCenter Server, ESXi Hosts, Virtual Networking and Storage. 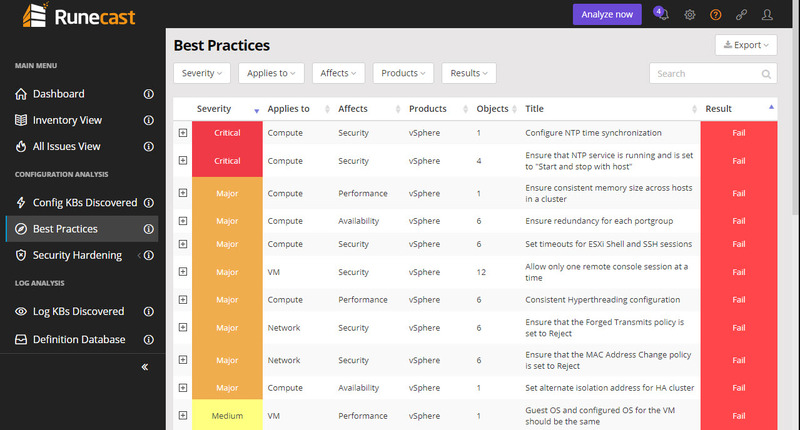 It can also monitor other products such as NSX , vSAN etc. Runecast Analyzer maintains VMware KB Articles to monitor your vSphere Infra and based on that it will give you the Issues occurring in your environments and solution based on that. So, you don’t have to look for solutions outside on the Internet. 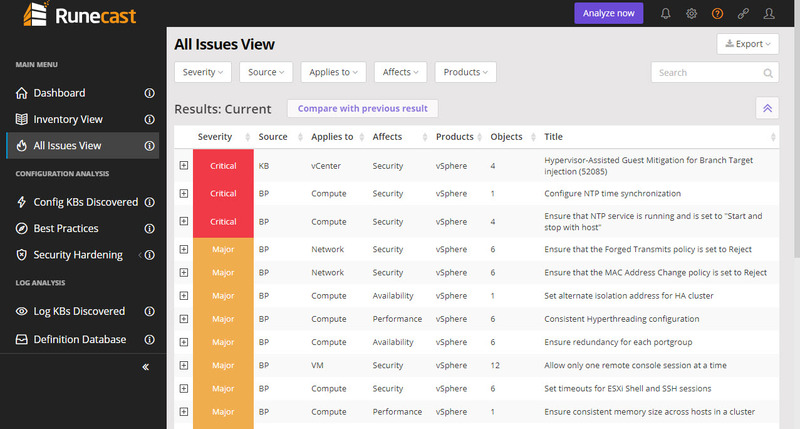 Runecast Analyzer also shows the information based on the various affect levels such as Availability, Security, Performance and Manageability. So, you can easily identify the problems with your vSphere Infra which are impacting your VM Availability and Performance. For monitoring you simply have to deploy the Runecast Appliance and Integrate it with your vCenter Server. That’s it, Now Runecast Analyzer will Pro actively analyze and monitor all your virtual resources. Dashboard will show you the complete overview of the monitoring of your vSphere Infra, so you can have a look at How many critical and major issues are there. All Issues view will display all the issues which are occurring on your environment based on the various severity levels such as Critical, Major or Low. So, once you get all the issues you can easily solve it and make your virtual infra more efficient. You can also sort the issues based on the Impacts, Products and Applies. You can get all of the Environment issues at the single place and you can resolve it. 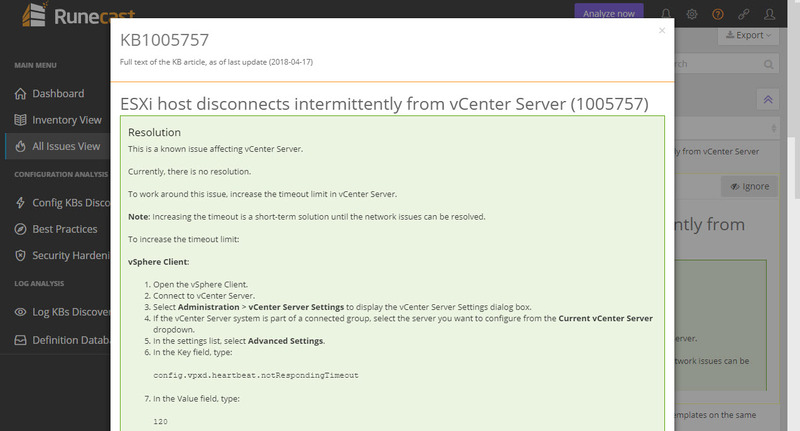 In the Image below, you can see first issue of the ESXi Hosts connectivity with vCenter Server. As you can see from the Title you can have overview of the Issue. So Now to check on that issue just Click on the Plus Box to Expand about the issue. Here in the below image you can see complete details of the issue. 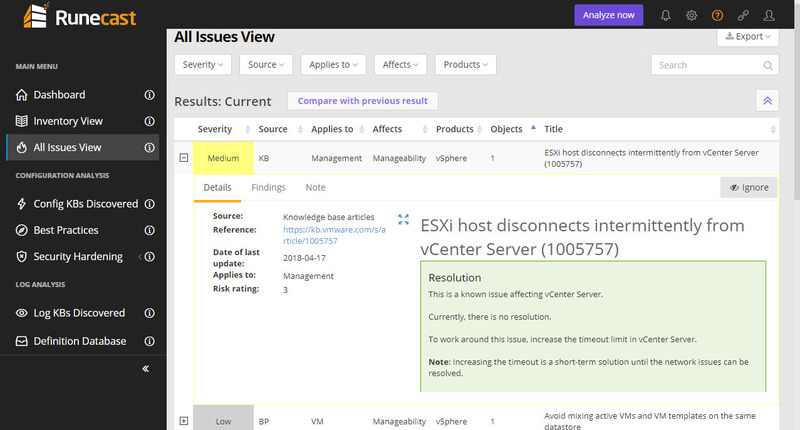 It also helps you with the VMware KB Articles so that you can easily find your solutions here only. Now you can click on the Expand Icon to show the VMware KB Article so that you can easily resolve the issue without going to internet. As you can see from the Above image that it has displayed VMware KB Number and the whole KB Article so you can easily perform steps to resolve your issues. It also provides the functionality of Reporting so that you can easily export all your issues in CSV File or PDF File. Runecast Analyzer provides the Best Practices view so that you can easily find out if you are following Best Practices for your environment or not. 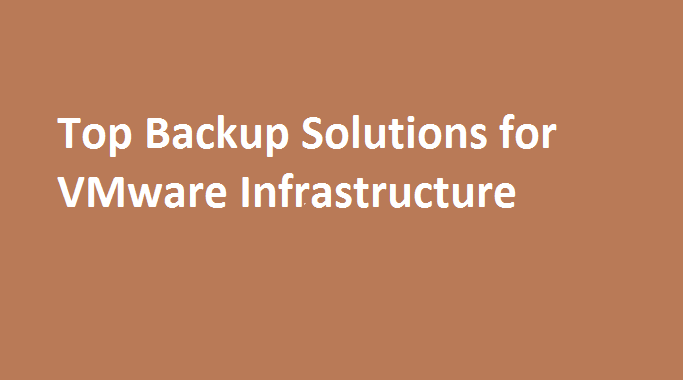 It will check for the Best Practices for your vSphere Infra and if it finds that you have not followed the Best Practices then it will show Result as Fail. So, you can see and follow the Best Practices in your vSphere Environment as well. As you can see from above all the information that Runecast Analyzer is the recommended product for your VMware vSphere Environment so that you can run your vSphere Infra efficiently by avoiding the issues coming and follow the best practices for your environment. Note: This is Sponsored Review.